Despite the publisher’s description of this as a biography, it is rather a finely detailed historical novel that sticks closely to the facts of this little-known Latin American activist. Born into a rich, slaveholding Cuban family, Emilia is filled with zeal for freedom from an early age. She refuses to submit to the silent, submissive role of a woman of her time and station, rebelling against her conservative father by championing suffrage for slaves and Cuban independence from Spain. When asked while abroad to deliver contraband papers to her native island home, Emilia sees her chance to be in the thick of the rebellion against Spanish authority. Even though she would be branded a traitor and endanger her family if caught, she fearlessly accepts and carries out her mission. 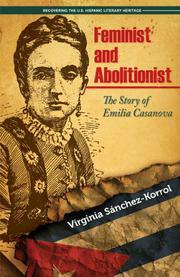 In the fictionalized first-person voice of her subject, Sánchez Korrol chronicles this and Casanova’s many other accomplishments: writing political essays (the first Cuban woman to do so), addressing the United States Congress as a representative of Cuban women fighting for independence, and attempting to internationalize the Cuba Libre movement. Unfortunately, although Casanova is a fascinating character, the author’s scholarly approach burdens the story with so much historical detail that the narrative fails to compel.